My monthly column for November in two diocesan magazines, the Church Review (Dublin and Glendalough) and the Diocesan Magazine (Cashel, Ferns and Ossory), marks the 80th anniversary of Kristallnacht. On the night of 9/10 November 1938, Nazis and members of the Hitler Youth went on state-sanctioned rampages against Jews throughout Germany and Austria. That night 80 years ago is remembered as Kristallnacht or the ‘Night of Broken Glass,’ and many say it marks the unofficial beginning of the Holocaust. 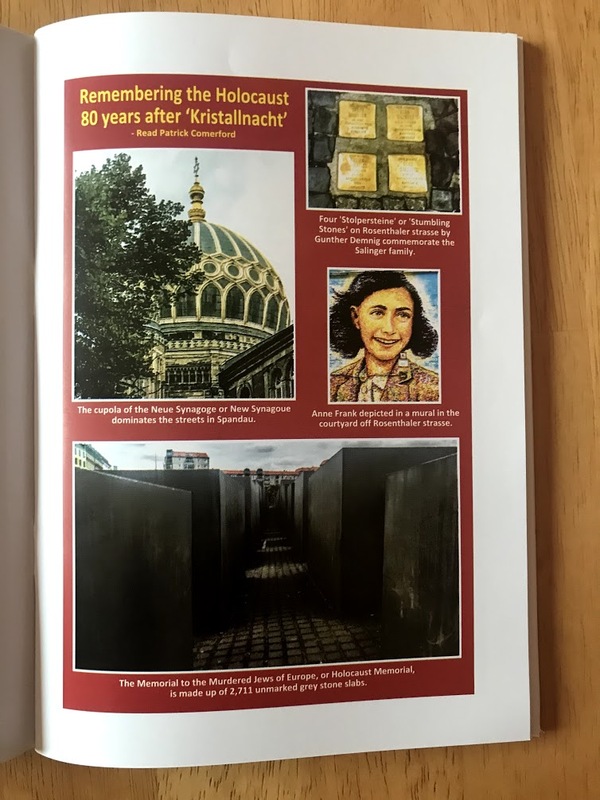 He has also uses a collection of my photographs in a full-page colour spread to introduce this seven-page feature, Remembering the Holocaust 80 years after ‘Kritallnacht’. The two magazines are being distributed in parishes and churches tomorrow [4 November 2018]. So, more about Kristallnacht on this site tomorrow afternoon [4 November 2018], with more photographs and a full account of my recent visit to synagogues, museums, memorials and other sites in Jewish Berlin. As I was researching the story of the abbey and church ruins in Croagh, Co Limerick, and the links between the Walcott family of Croagh and the Rye House plot to murder Charles II and the future James II in 1683, I came also across the story of John Minchin-Walcott (1700-1753), who inherited the Croagh estates and who was MP for Askeaton, Co Limerick, from 1747 until he died in 1753. Minchin-Walcott was also the grandfather of Lady Eleanor Pery, whose husband, Sir Vere Hunt (1761-1818) of Curragh Chase, who was also MP for Askeaton (1798-1800). But as I wandered around the churchyard at Saint Mary’s Church, Askeaton, before a meeting yesterday, three or four graves reminded me that the Taylor family of Hollyfort was the one family who dominated Askeaton parliamentary representation in the 18th century. Between 1692 and 1760, five members of the Taylor family were returned to the Irish House of Commons as one of the two MPs for Askeaton, and on at least two occasions in the 18th century two members of the same family held both seats. At the end of the Desmond wars in this part of West Munster, and the confiscation of the vast FitzGerald estates, Askeaton Castle came into the ownership of Francis Berkeley, who received a grant of 7,000 acres of confiscated Desmond land in the area. Although technically the castle was in the hands of the Crown, Berkeley received a grant for the new Manor of Rock Barkley and settled 56 new families on the estates. In 1596, he married Jane Loftus of Rathfarnham Castle, a daughter of Adam Loftus, Archbishop of Dublin, and in 1597, he was appointed the Governor of Limerick Castle. James I granted him the castle for life, and the grants to the Manor of Rock Barkley were confirmed. Askeaton became a parliamentary borough, sending its own MPs to Irish House of Commons. Askeaton was incorporated by a charter of 1614, with a provost (or mayor) and 12 burgesses, and Edmond Drew was the first provost or mayor of Askeaton. Francis Berkeley died at Askeaton on 20 December 1615. His interests in Askeaton passed to his sons, first Maurice Berkeley (1598-1622) and then Henry Berkeley (1606-1625). But these Berkeley brothers had no children, and Askeaton Castle and the Berkeley manor were then inherited by the descendants of their sister Gertrude, who married John Taylor (1606-1660). After the restoration of Charles II in 1660, the Taylor family recovered the ruined Askeaton Castle and their estates. John Taylor and his wife Gertrude were the parents of Robert Taylor (ca 1660-1696) of Ballynort, the first member of the family to sit as MP for Askeaton. He was High Sheriff of Co Limerick in MP twice, first in 1692-1693 and again in 1695-1696. Robert also married into a branch of the Berkeley family, but Robert and Margaret had no children. Robert’s brother, William Taylor (1645-1712) of Ballynort, was the father of Robert Taylor (ca 1682-1723) of Ballynort. He was MP for Askeaton from 1703 to 1714, and then sat for Tralee, Co Kerry from 1715-1723. 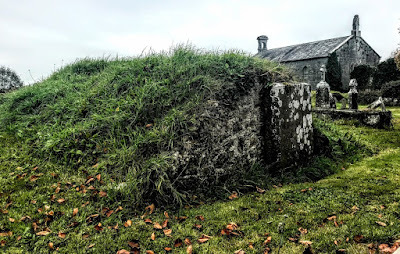 Robert Taylor died in 1723, and his estates in the Askeaton area and his political interests passed to his brother, Berkeley Taylor (ca1682-1736) of Ballynort, who had married Sarah Hoare, daughter of Edward Hoare of Cork. Berkeley Taylor too was MP for Askeaton, from 1723 to 1736, holding the seat until he died on 25 June 1736. Robert and Berkeley Taylor were the brothers of Richard Taylor of Ballyglahane (Hollypark), who erected a large vaulted family tomb at the south-east corner of Saint Mary’s Church, Askeaton, when his young son Robert Taylor died in 1726. The family members buried in the tomb include Richard, his wife Mary Finch, who died in 1730, and their son Robert. Other Taylor family graves are against the south wall of the church. His descendants continued to live at Hollypark until the mid-20th century. The fourth family member to sit as MP for Askeaton was Edward Taylor (ca 1694-1760), who was MP for Askeaton from 1727 until he died in 1760. While he was MP for Askeaton, the second seat for the borough was held at times by two other members of the family: Berkeley Taylor, who was MP in 1723-1736, and William Taylor, who was MP for Askeaton from 1737 to 1746. When Colonel Edward Taylor died in December 1760, he was succeeded by his only son, also Edward Taylor. But Edward drowned in the Isis in 1769 while he was a student at Oxford, and the male line of this branch of the family became extinct. Colonel Edward Taylor was also the father of two daughters. Catherine Taylor married Hugh Massy (1733-90), 2nd Lord Massey, in 1760, and so Askeaton Castle and the Taylor family estates passed to the Massey family. Her sister, Sarah Taylor, married Henry Thomas Butler (1746-1813), 2nd Earl of Carrick, and the right to nominate the MPs for Askeaton became vested in Lord Massy and Lord Carrick, who were also patrons of the rectory. Both Lord Massy and Lord Carrick received substantial financial compensation when the ‘rotten borough’ of Askeaton was abolished at the Act of Union in 1800. Meanwhile, Sir Joseph Hoare (1707-1801) was MP for Askeaton, and claimed he the seat for life under an agreement with Edward Taylor, to whom the rotten borough belonged. Hoare was a brother of Sarah Hoare, wife of Berkeley Taylor, MP for Askeaton in 1723-1736. His father, Edward Hoare, had been MP for Cork. During Hoare’s life, the husbands of the Taylor sisters, Lord Massy and Lord Carrick, were elected alternately to the other seat, with the understanding that after Hoare’s death they would each have a seat. Carrick usually sold his seat; for instance, in 1790 he sold it to the newly ennobled Lord Caledon, who brought in his nephew, Henry Alexander. However, Hoare did not die during the lifetime of the Irish Parliament. With the passage of the Act of Union in 1800, Askeaton was disfranchised as a parliamentary borough. The sitting MP, Sir Vere Hunt, who had bought his seat, received £1,100, Lord Carrick received £6,850, the trustees of the will of Lord Massy were given £6,850, and Hoare received a mere £200. Holly Park was sold by the Taylor family in 1939, and a son of Tom Clarke, one of the leaders executed after the Easter Rising in 1916, bought Holly Park from the Land Commission in the 1940s. Other Taylor family homes in this part of Co Limerick included Woodcliff, sold in 1888 and later the home of the Fitzgerald family, and Faha, which is now a ruin. Ballynort, which passed by marriage to the Massy family, was no longer standing by the end of the 19th century.